Thousands of horse trailers travel the over crowded highways every year. 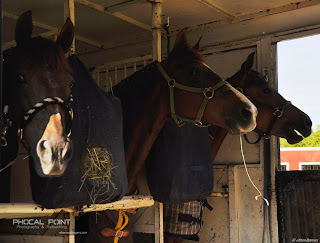 With the implementation of safety inspections of horse trailers in various jurisdictions, much has been accomplished to make trailering safer from a mechanical standpoint. However, equine behaviour, human error and weather conditions are still major risk factors when transporting your horse. Unlike other cartage, the horse trailer carries live, fragile, and sometimes volatile cargo. As such, when an accident happens, specialized urgent care and action must be taken. All first aid courses adhere to a universal set of guidelines that also apply in horse trailer accidents. Should you have a horse trailering accident or come upon the scene of one, an appropriate plan of action should be followed. Survey the accident scene before attempting a rescue, making the environment as safe as possible to work in. Investigate to determine if there are any injuries to humans first. Catch any loose horses and restrain them to prevent additional accidents. Assess the horses involved as to size, position in the trailer and injuries. Those horses that appear trapped must be extracted from the trailer only after careful, but swift plans are developed for an imminent rescue. Assess the injuries of the horses involved. Can the horse be saved to continue a reasonable quality of life? Humane destruction by a veterinarian at the scene of the accident may be necessary. A panicked horse can create a more perilous situation in the trailer making it more dangerous for other horses and their rescuers. A strong nylon halter (not leather) that fits properly, along with a heavy duty cotton rope that will extend out of the trailer by an additional ten feet. A supply of compression bandages to control major bleeding. Cotton balls to plug the horse’s ears to aid in sedation and minimize the noise of cutting tools. Before attempting to extract a horse from trailer, you should ensure that the vehicles are secure. You accomplish this by stabilizing them through cribbing or supporting them. You may require professional help. In the event of a rollover, trained assistants will be required. In some cases, “the jaws of life” used by firefighters, might be employed to open the roof or a side of a trailer to rescue the horse. Removing a horse from a damaged trailer will require some brute force. A thousand pound or better, immobilized horse is a daunting task to move. One should exercise great care when working with the accident victim horse, bearing in mind the following safety conditions. · Work with a down horse from a safe position behind the horse’s back. · Reach over the horse’s body to reposition its legs. Remember, a horse can reach three feet in front of their shoulders and can kick three and a half feet behind them with their hind feet! · If you have assistance, have someone hold the horse’s head down by kneeling on the neck behind the head. The handler can soothe the horse while the legs are being prepared. · A cotton loop should be made and placed around the pasterns, manoeuvring the leg so it can be folded tight into the body. · Once all four legs are freed and folded tight into the body, the horse is ready to be rolled into position for removal from the trailer. Depending on the position of the horse, you can either pull forward using the halter and grasping the mane while tugging on a girth rope, or you can pull backwards by using a tail rope or a lifting harness. With your first aid supplies organized for your trailer, you should also consider your towing vehicle and emergency repair kit. All of these items are easily attainable at your local automotive store. Current road map, cell phone with extra battery and possibly “On Star” capability if your vehicle is equipped with it. GPS systems are a popular navigational tool but are not perfect and may not be appropriate for use when trailering with livestock. Spare fuses for your truck. Flashlight, traffic safety vest, minimum of six flares. First aid kit for humans. Safety boots and work gloves (two pair). Duct tape and electrical tape. Shovel, broom, bucket and garbage bags. Assorted hand tools, spare nuts and bolts. Wheel wrenches to fit both your vehicle and trailer. Load binder with a ratchet. Three to four blocks of 4”x4” size wood approximately one foot in length to stabilize your vehicle at trailer height. Inflated spare tire for both truck and trailer and hydraulic jack. One can of penetrating oil for loosening nuts. For those that sit behind the wheel of a towing vehicle, you should educate yourself in the basic use of many of the above listed items. Women in particular may find many of these items foreign. Local educational facilities may offer an introductory mechanic’s course that may prove very beneficial. Take a first aid course for humans and learn how to monitor and assess the vitals of the horse. Leather halters are recommended for shipping, but in the event of an accident, you will need a halter strong enough to support the weight and struggle of a frantic horse. Shoe puller can be obtained through a farrier supply store. Load Binder with ratchet, also referred to as a “come along” can be purchased at any automotive supply store.